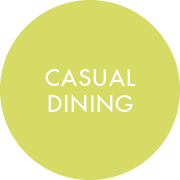 Having selected your tableware, then complete the presentation solution with glassware from Cantina or Classic Bar and cutlery from Profile or the ever-popular Miravell, and truly delight your customers. These ranges create the foundation of your presentation solution. Use pieces from these ranges to create signature dishes or to help with menu day-parting. Our cutlery has been selected to enhance any tabletop.